•Played for the Spokane Shock for two years (2006-07). •Helped the Shock win the ArenaCup in 2006. •Shock’s career tackles leader with 168. •Helped win the Arena Bowl championship as a defensive back for the Philadelphia Soul of the Arena Football League in 2008. •Served as the Shock’s defensive backs/special teams coach in 2009. A month ago, the Spokane Shock won their second ArenaCup championship. 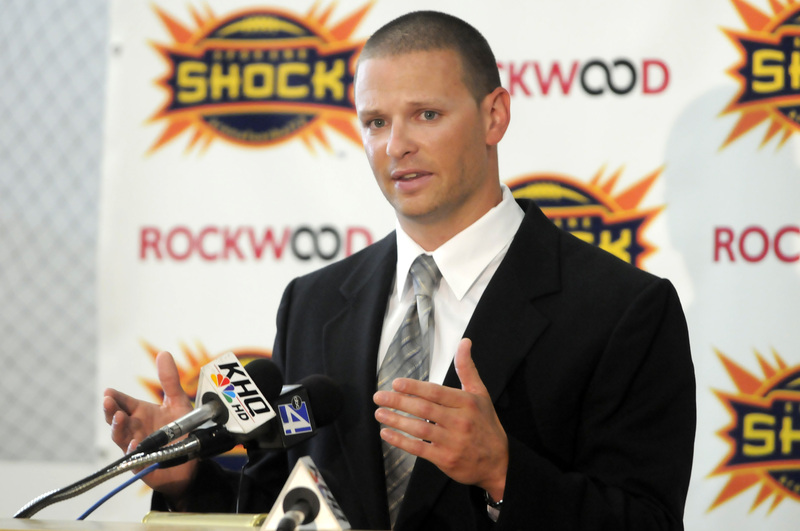 A week ago, the Shock essentially confirmed they’ll be joining a new, tougher arena football league. And Wednesday the changes kept coming as Spokane cut ties with head coach Adam Shackleford, who guided the team to a 49-8 record in three years, and announced the hiring of former Shock standout Rob Keefe. The unexpected coaching change came as a shock to Shackleford, who was asked to put together an operating plan for the new league, which is expected to be formally announced Monday in Tulsa, Okla. When Shackleford’s plan, which included suggestions from his assistants, including Keefe, didn’t win over ownership last week, they decided to consider other head coaching options. Keefe, who coached defensive backs and helped coordinate special teams, was the only other candidate “interviewed in depth, though we had a lot of names that would have been of interest,” general manager Adam Nebeker said. By Monday, owners agreed a change was necessary, knowing that the decision might be met with howls of protest from some Shock faithful. “From the outside, if you just look at the resumes of who has done what as a head coach, it’s going to be one-sided because Rob hasn’t had the opportunity to be a head coach,” majority owner Brady Nelson said. “But if you’ve been around Rob for any period of time, you know that he is a tremendous leader, tremendous motivator and knows arena football like nobody I’ve ever met. Shackleford was told earlier this week he wouldn’t be retained for a fourth season. “I felt great about the plan,” he said. “We were going from what I felt was the big fish in the small pond to a smaller fish in a big pond and I felt like some things needed to happen to make Spokane more marketable, beyond having our terrific fans. Going for a higher-caliber player and saying, ‘We sell out every game,’ wasn’t good enough. We felt like we had a great start in recruiting. That direction will be charted by Keefe, a fan favorite who played for Spokane in its first two seasons, including the 2006 ArenaCup championship. He moved on to Philadelphia, which won the AFL title in 2008, and rejoined the Shock as an assistant in 2009. Keefe said he was receiving interest from other arena teams that are forming, including one head coaching offer, but hoped he’d have a chance to stay in Spokane. Alex Sirianni will stay on as defensive coordinator. Former Shock assistant and ex-AFL quarterback Matt Sauk has agreed to become assistant head coach and offensive coordinator. Keefe is optimistic Steve Emtman (defense) and Tom Ackerman (offense) will continue on as line coaches. “Coach Shack gave me my first opportunity in this league and taught me so much about this game. I could never say a bad thing about him,” Sirianni said. “I have all the confidence in Rob Keefe. I have seen him as a player and I’ve coached with him and I’ve seen what he can do. Keefe’s focus is on his coaching staff and finding players. Shackleford plans on keeping his family in Spokane for the time being. He said he already has three offers to become an assistant coach, but he made it clear he wanted to remain with the Shock.